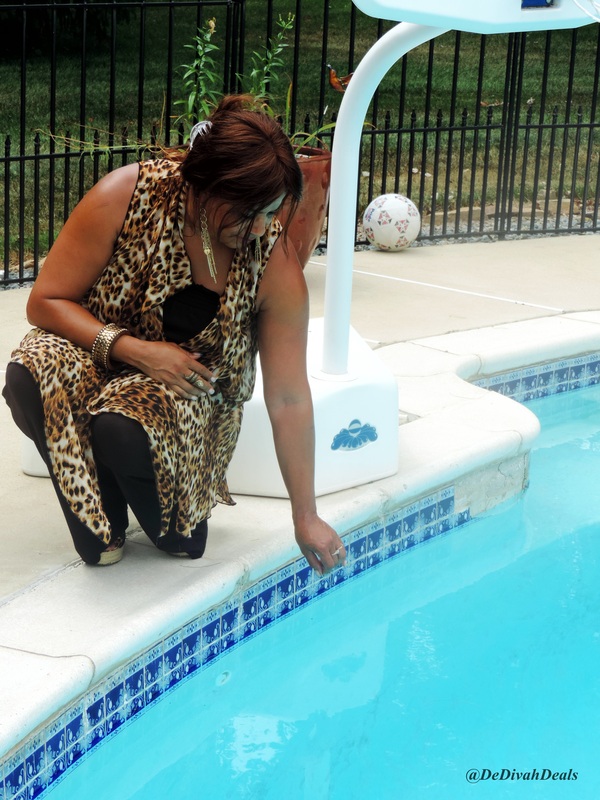 Recently I was contacted by Pauline Durban, president and founder of Covered Perfectly, a company whose sole purpose is designing cute, flattering clothing for women over 40. She asked if I would be interested in a doing a product review and giveaway so after checking out the online catalog I enthusiastically agreed. There were several cute tops but I selected this Cascading Vest because in my mind I envisioned wearing it to an outdoors party or out to dinner with hubby. The vest is available in four fabulous prints and because I already had a pair of leopard print shoes I chose this style to match them. 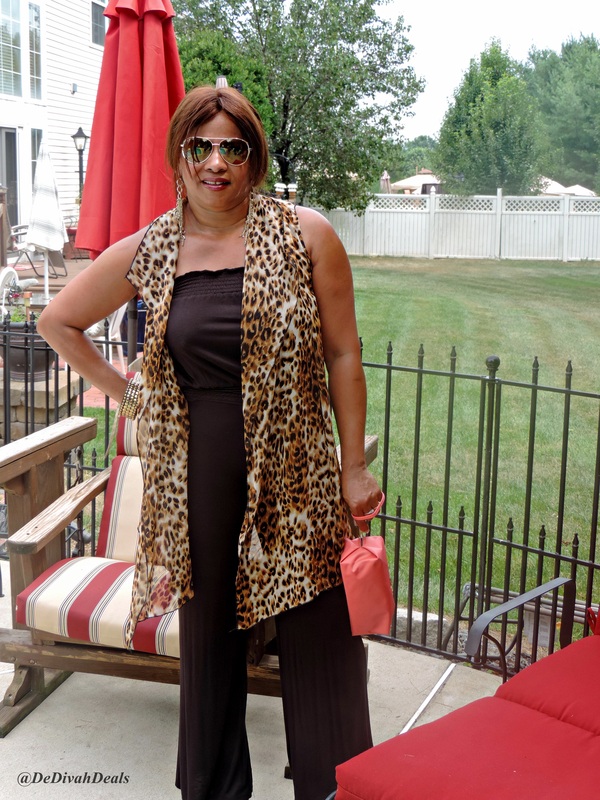 The Cascading Vest is the perfect accessory to any outfit whether for work or leisure, it works great with pants, jeans, or even a strapless jumpsuit as in how I wore it. The vest is available in sizes small to extra large and 1X-4X and is flattering to all body types. Pauline has graciously offered to give a $50 Gift Certificate to one of my lucky readers. This Rafflecopter Giveaway will end at midnight on August 2nd, so take a look at her online collection then come back to leave a comment on which item you would choose if you won. If see something that you want to order now, please use the discount code “DD20” to receive 20% off the total. Good luck and we’ll chat later. This is a sponsored post, for more information please read my Disclosure Statement located in the top tab. When Did I Teach My Sons How To Peel a Potato? I wpuld love the cascading vest in zebra. Yes, I love the zebra print as well. Thanks for entering. Yes, great minds. Would you believe that the jumpsuit had been hanging in my closet for 2 years, tags still attached! Hmmm, never thought to wear a cascading vest like that with a jumpsuit. Great idea. The vest was a great choice by the way. 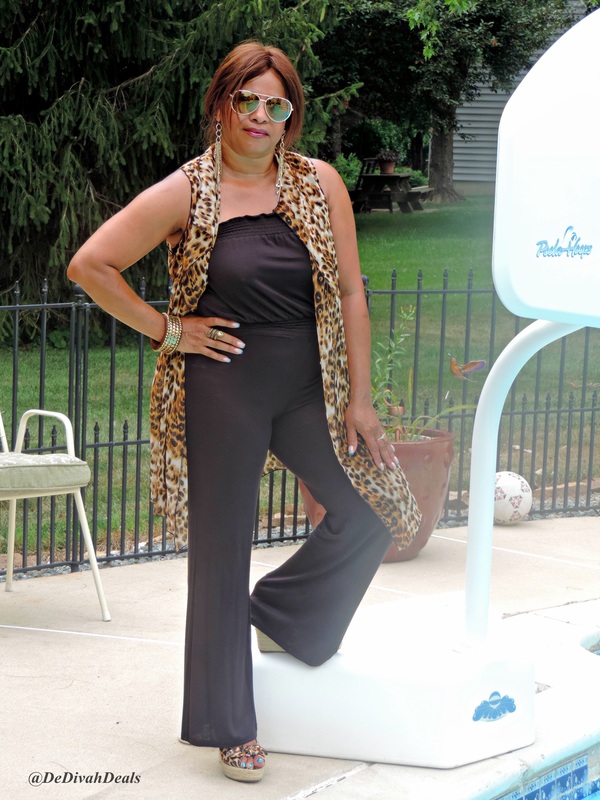 Thank you Ayana, the jumpsuit had been hanging in my closet for over 2 years because I didn’t know how to wear it solo so this was perfect for it. Hope you had a good Monday. Thank you sweet lady, I hope you had a wonderful weekend. Love the look. I am not normally a fan of the leopard print; however, I would wear the total ensemble. Aah a convert…you would look lovely, try starting with an animal print scarf, wearing it as if it were black. Yay, we found the like button! We LOVE leopard print. Cool beans, I wondered where you disappeared to – congrats again on the book, can’t wait to get my copy!!! I love the leopard print! I think 30 y/o like myself can wear this ensemble too! oh yes you would and with a matching head wrap you would look fierce sis!!! You look fabulous. I am such a sucker for black and leopard print. You wear it will doll. Coming from you that is truly a humbling compliment – thank you Miss Missy! Hope you are having a fantabulous evening. I love. LOVE. LOOOVVVVEEE!!!!! Covered Perfectly. I think I have about eight tops. They are so comfortable and flattering. Pauline is wonderful and takes such good care of her clientele. I am looking forward to getting a wrap sometime in the future. Any clothing that makes me feel good about myself and less body-conscious gets two enthusiastic thumbs up! Wonderful, now I hope you will enter for a chance to win so you can get that wrap. I simply love this Cascading Vest and agree with your comments about Pauline, she seems like a wonderful woman. Thank you my dear, enjoy your holiday! I love the simple comfort in blue, XL please. All of them are nice though. Yes, they are all great tops, thanks for entering. I hope you are having a terrific Tuesday. Great choice, I was also going to choose that top. Hope you are having a wonderful week. Lady, you are workin it in that wrap. Still have lots of time this summer to wear it 🙂 Cheers! And you know it, I will definitely be rockin it until the first snow flake…remember those? Hope you had a terrific Tuesday. Yes, much luck my dear! Yes, I love that one as well – thank you for entering and good luck. Have a fantastic Fri-Yay and a wonderful weekend! i’d pick the mandy shirt in coral! Nice choice, thanks for entering to win – good luck and have a truly awesome Fri-Yay!!! I like the Wrap Over in Malt. I like the cascading vest with the circle print. Yes, this vest is such a great accessory to have – thanks for entering to win and good luck! I will def get some pattern of the cascading vest! Yes, isn’t it a great print for this vest? Thanks for entering and good luck!